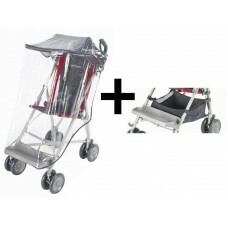 This Major Elite Buggy Accessory Pack allows you and your child to be prepared for what ever the weather brings! The PVC raincover requires the sunshade to work, as it extends the contact area of the hood, which allows the PVC raincover to simply hang off the sunshade. The sunshade by itself provides a good level of protection from the sun, and also includes a clear plastic window to allow you to check on your passenger when you are pushing the buggy along. This is for the hood in Charcoal (although the picture displays the PVC on a Red / Charcoal buggy) with matching shopping net in Charcoal too!